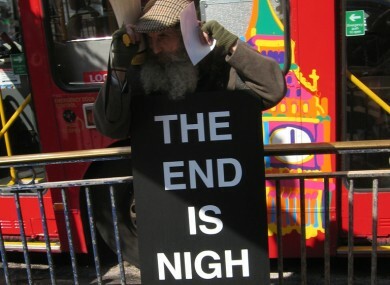 A former top UK government adviser has some dire predictions for the global economy. THE COLLAPSE IN Chinese stock prices and fears over the fragile state of the global economy has triggered some dire warnings from those expecting another financial crisis. Stocks in Shanghai closed down over 7% today, piling heavy losses on yesterday’s plunge which was the worst daily fall since 2007. It was the biggest rout on Chinese shares in nearly two decades and today the People’s Bank of China reacted by cutting interest rates for the fifth time since November last year. The move was enough to send European markets flying, making up for much of yesterday’s losses. But the amount of easy money flooding markets thanks to low interest rates worldwide and central banks conjuring up cash has some spooked that a much more serious crash is pending. Leading the doomsayers was Damian McBride, a former advisor to UK prime minister Gordon Brown. For 18 months, the first thing I've done waking up on a weekday is search 'Shanghai Composite' on Twitter. This has been coming a long time. Advice on the looming crash, No.1: get hard cash in a safe place now; don't assume banks & cashpoints will be open, or bank cards will work. Crash advice No.2: do you have enough bottled water, tinned goods & other essentials at home to live a month indoors? If not, get shopping. Crash advice No.3: agree a rally point with your loved ones in case transport and communication gets cut off; somewhere you can all head to. While the tanking of Chinese shares has left investors rattled, markets across the globe have rallied following yesterday’s “black Monday” crash. The main Asian indices were up, while London’s benchmark FTSE 100 has regained about half its losses from yesterday. McBride wasn’t alone in predicting another financial crisis could be on the horizon, although others were less extreme in their advice to the average punter. While China’s economy has continued to grow at an official rate of 7%, many believe the country’s communist officials have been massaging the numbers to paint an overly rosy picture of the national finances. A major fear is that with interest rates already at record lows in many major economies, central banks have little ammunition left to stimulate growth if national finances start to sputter again. Other developing nations are already struggling with the drop in the prices for commodities like oil and metals as China’s massive industrial sector slows down. However plenty of analysts are convinced there is no renewed financial collapse on the way. Goldman Sachs this morning told investors another global recession was “very unlikely” and there was enough strength outside China to weather the storm. “The drop in commodity prices during the past year and recent economic and (foreign exchange) weakness in China and other emerging markets will not tip the global economy into recession, in our view. Email “Does the 'great fall of China' mean it's time to stockpile canned goods? Some seem to think so”. Feedback on “Does the 'great fall of China' mean it's time to stockpile canned goods? Some seem to think so”.